Towards the end of June (2004), I began to feel tired. Abnormally tired. As in, I-needed-to-take-three-hour-naps-every-day-tired. Which is, of course, not normal for someone who is thirty years old. In addition, I often felt sick and didn’t want to eat but then, I was a busy bride planning a wedding so I chalked it up to stress and moved on. In those days, we heard and accepted more of the grace part of Christianity and pretty much ignored the other parts. On the way home from dinner one evening, I looked at Jason and suggested we stop at Walgreen’s because something just wasn’t right. The following morning, I was relieved. There were indeed two pink lines but the second line was very faint. Close call. “What do you think?” I asked my future husband. Still not convinced, I called my closest heart sister, Jennifer. “Well . . . I’m going to have to see it,” she answered. Standing in her doorway, seven months pregnant herself, she looked at the test. “I don’t know, Natalie. I think you’re probably pregnant,” she confirmed. So I decided to call my doctor. One of the nurses answered and we talked. Me: I don’t think I’m pregnant but I just need to be sure . . . I took a test this morning and there were two lines but the other line was super light – I mean, you could hardly see it. So I’m just confirming that I’m NOT pregnant. Nurse: Honey, you ARE pregnant. If there are two lines at all, of any color, you are pregnant. Crap. And joy. It was a crap/joy moment. Crap because well . . . this isn’t how we planned it. And joy because I wanted nothing more than to be a mama. Two days later, I had an already-scheduled appointment to get the required tuberculosis test all women in the state of Indiana needed to take before obtaining a marriage license. “While you’re at it, will you also test to see if I really am pregnant?” I asked the nurse. Wearing a knowing smile, she nodded and told me she would call me later in the day with the results. I’m pretty sure she turned the corner and let that laugh right on out because clearly, I was pregnant. And in complete denial. Right after the appointment, I stopped at a local grocery story. 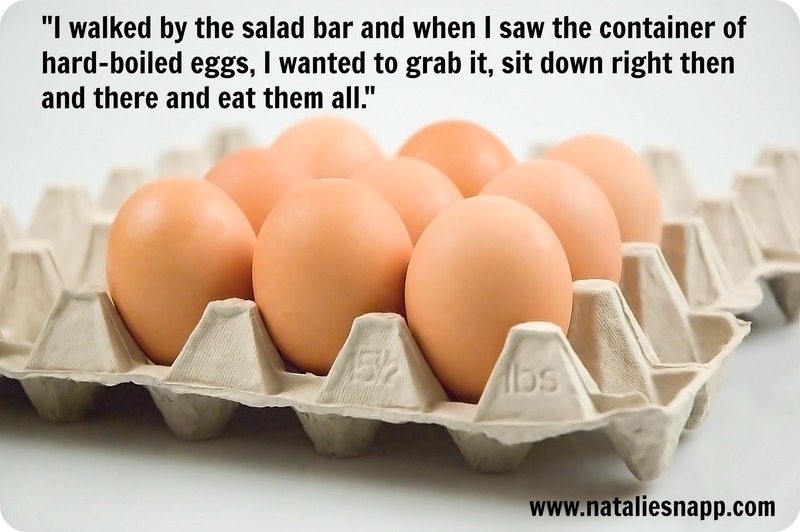 I walked by the salad bar and when I saw the container of hard-boiled eggs, I wanted to grab it, sit down right then and there and eat them all. Eating hard-boiled eggs with reckless abandon isn’t something I usually craved. I didn’t need the nurse to call me. The hard-boiled eggs confirmed what deep-down, I already knew. What about you? Have you ever had a crap joy moment? Stay tuned for Part Fourteen next Monday . . .
Natalie, you frequently make me laugh with your eloquent honesty! Yup – "crap/joy" definitely describes my life sometimes!